Foreign or external dogs pose a risk to any on- farm programme in place. 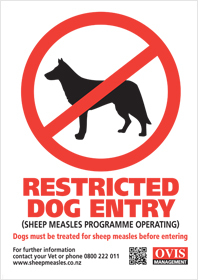 Unless you are aware of their status in relations to Sheep Measles treatment all foreign dog should be deterred or the person in control required to show some evidence of treatment for sheep measles. Dog owners name and address. Treatment date should also be clearly shown. The signature of the Veterinarian or credible animal health advisor. Certificates should be valid for a period of one calendar month from the date of the last treatment. Recommended Policy – No evidence of treatment No access to property.